One of those names that you thought you knew, but turn out to have been unfairly ignoring, Koldbrann hail from Norway and play an enjoyably grim and frostbitten form of black metal that isn't afraid of melody or groove. From this release alone, a two-song single, I immediately wanted to listen to the rest of the band's discography, a definite mark of quality. Similar to Sweden's Watain in some ways, if less heavy metal in style, Koldbrann's sound is as dark as their name ('gangrene') suggests, complex and engaging music that looks back to black metal's past whilst being very clearly of the present. The first song, Totalt Sjelelig Bankerott ('total soul bankruptcy') is an energetic bit of melodic black metal that focuses heavily on the riffs but with good drumming that rarely blasts, and somehow manages to include two breakdowns without detracting from the atmosphere! Kvelertak's Erlend Hjelvik pops up for a guest vocal spot, sounding very Csihar-y in spoken word, and the band pack plenty of riffs in. Despite having groove, this is far more Kampfar than Khold, and as a taster for forthcoming new album Vertigo in 2013 is excellent. Kasjtjeijs Svøpe, the second song, is slightly less impressive but still excellent. Opening with ominous yet strangely grandiose groove, shimmering guitar lines soon lead you by the hand as the song heads into a dark inwards spiral, more repetitive and hypnotic than the first track. 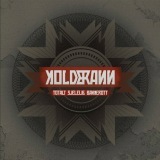 An excellent introduction to the band, Koldbrann are a name I'll be exploring further in the future for sure.